The funny thing about reading Fleming’s original novels after being so intimately familiar with the films is that one draws interesting comparisons between the two. The novels are relatively “small” stories, centered around one or two locales, with tight action; the films, on the other hand, are big and bombastic with ridiculously opulent set pieces and cartoonish villains that seems like a Bizarro World analog to the source material. Not that there is anything inherently wrong with either (I thoroughly enjoy the films every time I watch them), but it’s interesting to note what’s different and what stays the same. 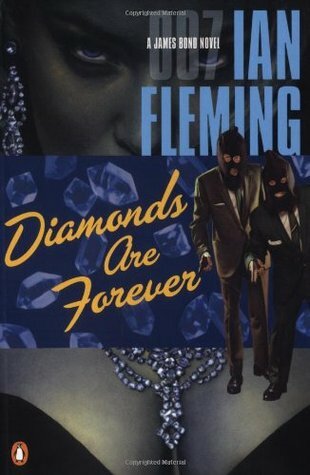 In Flemming’s Diamonds Are Forever, Bond is assigned to infiltrate and topple an international diamond smuggling racket. In the film, though, the smuggling is only one small–almost unrelated–aspect of a ridiculous plot to build a satellite-mounted laser capable of incinerating capital cities. Bond would hardly even be on the case if it weren’t for his quest for revenge against Ernst Stavro Blofeld for killing his new bride in the previous film. The diamonds are just a happy coincidence in the film. In the book, Bond once again needs to infiltrate the world of American organized crime (with a little help from and old friend) starting in New York, but instead of whisking away to the Caribbean for the third act, Bond is instead transported to the atomic-era glitz of the (then brand new) Las Vegas strip. No satellites this time. No mysterious analogs to Howard Hughes. Just Bond, his wits, and Tiffany Case who becomes the first in the line of villainous Bond Girls to be seduced and “turned straight” by 007. Come for the suspense, stay for the action. This is one of Fleming’s best!